Nick Foles has no memory of watching Drew Brees play ball at Westlake High School. He figures if he ever attended one of his games -- a distinct possibility as a native of Austin, Texas -- he was probably playing tag or tossing a miniature football around somewhere beyond the stands, seeing as he was just a young boy. Brees definitely remembers seeing Foles play. He returned to Westlake for the 10th anniversary of the team's 1996 state championship -- still the only one in school history -- and watched as Foles led his old squad and chased down his old records. "It was actually during the season. 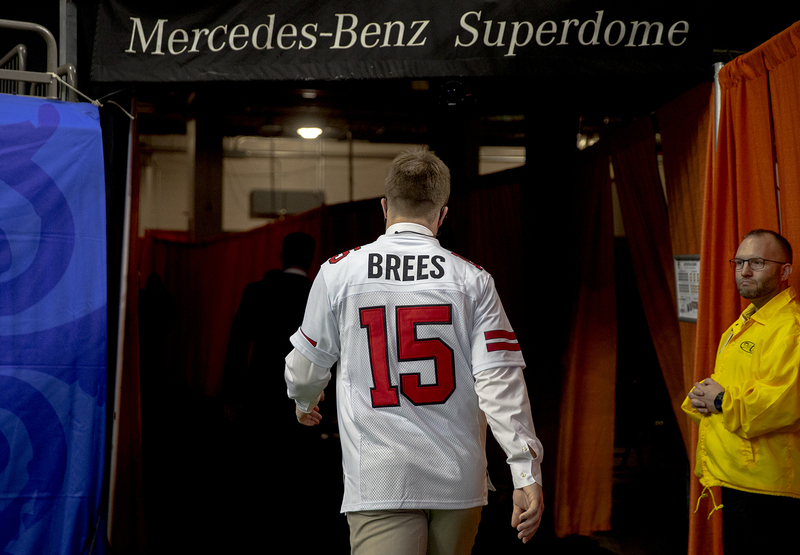 It was a Friday night," Brees said. "I remember flying back and kind of being part of that homecoming experience, and the starting quarterback for my high school at the time was Nick Foles. Funny how things play out." On Sunday, Brees and Foles will make history, becoming the only Super Bowl MVPs who attended the same high school to face off in a playoff game when the New Orleans Saints host the Philadelphia Eagles in the divisional round (4:40 p.m. ET). Brees and Foles had two distinct experiences. One had to overcome lack of size and familiarity, not to mention a highly touted QB in waiting; the other was a man among boys who had to live up to the instant hype of being "the best since Drew Brees." But those who were around them saw common traits, developed on the same fields, that have proved key to their now storied careers. Brees was a "little old scrawny thing" when he arrived at Westlake, according to his old defensive coordinator, Derek Long, who later served as Foles' head coach. Having attended a private middle school called St. Andrews, Brees was also an unknown -- not part of the feeder system like many of the boys. Plus, there was a quarterback by the name of Johnny Rodgers -- brother of Jay Rodgers, the varsity QB who would go on to play college ball at Indiana -- who was set to be the quarterback of the future. “When he came in there, he really didn’t know how to put his pads in his pants," said Brees' head coach at Westlake, Ron Schroeder. “I remember sitting in the stands watching the freshman B team," added Long, "and he’d be scrambling around, and he had this unique ability to avoid tackles and still get the ball to receivers. A little bitty thing, and those receivers, I can’t say they caught all the passes he threw to them, but that really caught my attention." Brees got the varsity gig starting his junior year, and Westlake went 28-0-1 with him at the helm. He tore his ACL during the quarterfinals his junior season -- an injury that prevented him from participating in college recruitment camps that summer, one of the reasons he received only a pair of college scholarship offers -- but he returned to lead the Chaparrals to a 16-0 record and the school's only state title his senior year. "When it comes to Drew Brees, him being the first successful quarterback, I think that kind of puts you in a different hierarchy when it comes to things around here,” said Steve Ramsey, current Westlake principal and Foles' former offensive coordinator. "A lot of the stuff we talk about as a program when it came to players like Drew is how he prepared each week, the way that he led the team, personal characteristics of what it takes for someone to have success. One of the biggest things that we talk about in our program is when correct hard work becomes fun, success will follow. Coach Schroeder and Coach Long, when they would talk about Drew Brees, those were the things they would talk about." Still, Schroeder won't pretend that he saw this type of NFL success coming for Brees. Ramsey remembers watching Foles play varsity basketball as a freshman. The type of competitive edge he played with while going toe-to-toe with upperclassmen would translate over to the football world well, he thought. The word on Foles was out even earlier than that. He was creating a buzz in the program dating back to middle school. Foles was the backup QB his sophomore season. If you want to know where his receiver skills came from, the Chaps used him as a tight end that year to keep him in the mix. Foles went on to throw for 5,658 yards and 56 touchdowns once he took the reins as a junior, breaking Brees' records of 5,464 yards and 50 touchdowns. He also guided Westlake to the state championship game as a senior, though the Chaps fell short in that one. For all of the aerial accomplishments, it was Foles' call to stick to the ground game that resonated the most with Ramsey. "We were playing a team in the first round of the playoffs [in 2006] and they had a pretty high-powered offense as well," he recalled. "It was one of those games where you could tell it was going to be pretty high-scoring and we were running the ball effectively. Nick found me and one of the running backs and we talked, and he kind of had the idea, ‘We’re doing real well. Let’s keep the defense off the field and let’s just run the ball the whole second half.’ It turned out we won, which was fantastic, but it just spoke volumes about how Nick puts the team first, that’s the most important thing." As you might expect from a school that produced Brees and Foles, Westlake promotes team success over individual accomplishment. So there are no shrines to them like the one you'll find of Foles in Chris Long's locker. Instead, you'll have to sift through their team composites outside the locker room, or search the array of about 50 photos near the gym of those who have moved on to play collegiate ball, to find an image of them. Yet their presence is very much felt -- and not just during weeks where the two stars are squaring off in the playoffs. This is the second time they've gone head-to-head in the postseason. The first was back in 2013 and resulted in a 26-24 Saints win. Texas quarterback and Westlake alum Sam Ehlinger paid homage to Drew Brees before the Longhorns' Sugar Bowl win by wearing Brees' No. 15 Westlake jersey. After eclipsing the Westlake records of Brees and Foles, look for Ehlinger to make it three NFL quarterbacks from the same high school soon enough. Though Brees wore No. 15 at Westlake and Foles No. 7, both went on to wear No. 9 in the pros. The little store on campus sells No. 9 Chaps jerseys in their honor, and the stands are filled with them on Friday nights. Texas quarterback Sam Ehlinger, who's also a Westlake alum, was seen wearing a Brees No. 15 Westlake jersey before leading the Longhorns past Georgia in the Sugar Bowl. Brees and Foles do community events in Austin, and Foles, with his family still in the area, is known to pop in from time to time. When he was rehabbing from a shoulder injury a few years back, he jumped onto the field with the Westlake team a couple of times to throw to the receivers. "That was a big deal for our kids at the time as you can imagine," current Westlake head coach Todd Dodge said. Leaders of the program still evoke their names, but it's not to speak of records or legendary moments in big games, they say. Instead, it's to discuss how the two quarterbacks prepared each week, the way they led their teams, and the personal characteristics it takes for someone to have success. ESPN New Orleans Saints reporter Mike Triplett contributed to this story.